Low energy consumption (excellent for campavans, caravans and mobile homes). Connector specification: +VE centre positive Bayonet (please check compatibility). YOU MAY NEED TO ALTER SOCKET POLARITY. Can be used to replace: Tail lights, Turn signal light, Corner light, Parking light, Side marker and Backup light, caravan reading lights, etc. NB. Red and yellow coloured filters must be used for tail and side indicator applications. 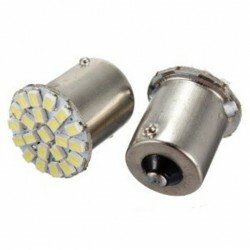 Voltage 12V or 24V Colour: PURE Bright white Type: 13 Surface Mount SMD LED technolo..
Colour: SUPER Bright White, Quantity: 2 bulbs Light Intensity 500 lumen Dimension.. The BA15S 1156 15mm bayonet 700 lumen LED bulb is powered by 48 type 3014 SMD LED's. The bulb uses.. 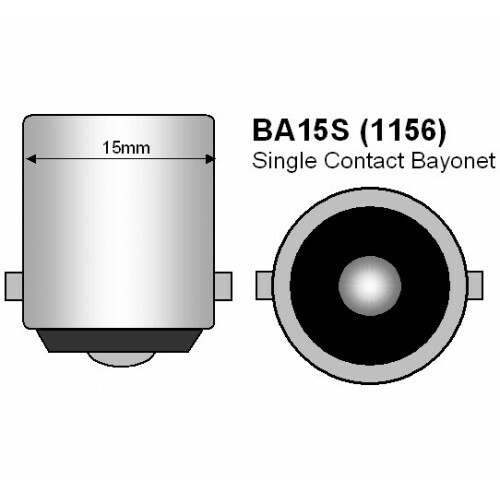 The BA15S 1156 15mm bayonet 800 lumen LED bulb is powered by 144 type 3014 SMD LED's. The bulb u..